Ben Gladhill (right), associate pastor of Lake View, writes: “This is Lake View Church’s 9th year doing Operation Christmas Child. Each year we do a pretty good job at collecting items for our shoeboxes and filled shoeboxes. This year we collected 110 shoeboxes for Operation Christmas Child. However this year we threw in a twist. Annie Emmons (right) of Sunfield writes: “I provide the people with the ready-made shoeboxes for Operation Christmas Child. Last year I challenged each adult class to make a box. Our Sunday school class, JOY (Just Older Youth), couldn’t decide if they wanted to do one for a boy or girl, so they did one for each this year. So many articles were brought in that we ended up with 4 from our elderly class! And all the money for the boxes was provided too! I was so proud of them all! “We all enjoy doing the boxes, and can only imagine the happiness of the boys and girls that receive them. We look forward to doing this each year! Some grandparents have their grandchildren go shopping for items to put into the boxes, and then fill the boxes. Everyone enjoys this project! Last year our church did 62 or 63, and I was afraid with the economy as it is, it would be less this year. But God provided and we topped that number! Praise His name! You read that right: 10,000 shoeboxes!!! Little Jacob Sheets helped pack these shoeboxes at Shepherd of the Valley UB. Veronica Sheets of Shepherd of the Valley writes, “As a church family we collected different items throughout the year. Then we as a whole church held a shoebox-packing day. We ate lunch, and then we got to work. In a matter of just a couple of hours, we packed 187 shoeboxes. Then they were loaded up on our pastor’s truck and taken to our drop-off location. In the photo is a little guy who helped pack the boxes, His name is Jacob Sheets. Claudia Blanche Myers-Glover, 88, passed away Sunday, November 27, 2011, in Carlisle, Pa., surrounded by her loved ones. A greatly beloved wife, mother, grandmother, great grandmother, and great-great-grandmother, she cherished the 50 years she served as a Sunday school teacher and 40 years as a United Brethren minister’s wife at various UB churches in the former Mid-Atlantic Conference. She and her husband, the late Rev. H. Dorsey Glover, served the Bowleys Lane UB church in Baltimore, Md., along with these churches in Pennsylvania: Trinity, Heidlersburg, Idaville, Strinestown, Cold Springs, Fayetteville, and Macedonia. Visitation Date: 9:30 am Wednesday, November 30, 2011. Funeral: 10:30 am Wednesday, November 30. Burial will follow at Druid Ridge Cemetery in Pikesville, Md. Location: Vaughn C. Greene Funeral Services, 8728 Liberty Road, Randallstown, Md. A memorial service will be held at 10 am on December 10 at Idaville United Brethren Church, 3590 Carlisle Road, Gardners, Pa. In lieu of flowers, donations may be sent in support of Sarah Glover (missionary to Papua New Guinea) to Sturgis Baptist Church, P.O. Box 844, Sturgis, MI; or to Idaville United Brethren Church, 3590 Carlisle Road, Gardners, Pa. 17324. Hoffman-Roth Funeral Home & Crematory of Carlisle, Pa., is in charge of the funeral arrangements and has information about Claudia and a guestbook. Here are a few more churches that participated in Operation Christmas Child. This adds to the previous listings here, here, here, and here. We still invite you to tell us how many boxes your church filled. Rev. Billy Simbo sent the following information on November 29 regarding the funeral for his wife, Mamei. “Mamei R. Simbo was laid to rest on Friday, November 25, 2011, after a wonderful service of celebration and thanksgiving at Eglise De Dieu Par La Foi in Philadelphia, Pa. Burial was at Ivy Hill Cemetery in Philadelphia. “The Simbo family wants to thank all our brothers and sisters who have prayed for us since the beginning of Mamei’s sickness until her home-going. Thank you for your gifts, contributions, cards, and flowers. We rejoice in the life she was able to live and all the people she influenced. She was a great ministry partner, a devoted mother and grandmother who reached many people with her smile and hospitality. 28 Nov And Yet More Shoeboxes! Every year, dozens of UB churches participate in Operation Christmas Child, a ministry of Samaritan’s Purse. Several thousand shoeboxes are sent by UB churches to children around the world. We invited churches to tell us how many shoeboxes they collected. We have posted results here, here, and here. We still invite you to tell us how many boxes your church filled. 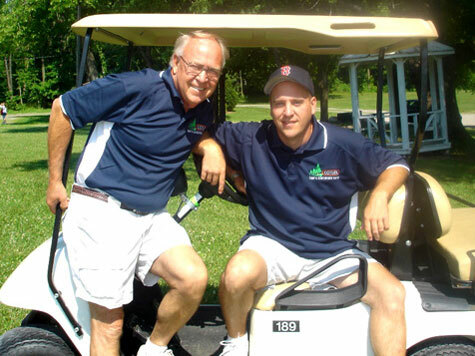 Pastor Chuck McKeown (right) writes, “We collected boxes from several other churches as well as our own. The total was about 100 more than last year.” Several youth helped package the boxes for shipment. “We do our shoe boxes as a joint effort from our small rural church. About 25 people attend per Sunday. Everyone brings/buys different items needed for the boxes and we complile them into sections–school supplies, personal care items, clothing for different sizes, fun stuff like stuffed animals, toys, etc., hard candy, and balloons. “This year we did our project over the summer months and set up the basement of the church to accomodate the items coming in. We made up the boxes and in each box put a sticker inside that read ‘cheque in other box’ so the head office would not waste time looking for payment in that box as we write one cheque to cover the entire amount of boxes. We also put the boy/girl stickers on the boxes ahead of time as well to save time at the end. “All you had to do was indicate the age category on the front of the box on the sticker. Then the fun began. A few of us went up several times during the hot summer days to work on the preparation for packing the boxes. One of our 87-year-old ladies came faithfully to unpackage crayons, toothbrushes, pencil crayons, etc. She even put together some of the boxes and labelled them. She was a wonderful help in all avenues of the adventure. She took great delight in seeing the finished product, as at the top of each box was a stuffed animal or doll which completed the smile both for her and for the child receiving the box. “We all had great fun seeing the new items coming in weekly to add to our collection for the shoeboxes and to see the number of shoeboxes growing. “To help fund the shipment cost of $7 per box, we have a ladies Friendship luncheon in May. The ladies are most generous in their giving, knowing the cause and the number of smiles that will be created by the gift of the boxes. We usually raise enough money to send at least 200-300 boxes. Further funding comes from either yard sales or from the men of our church who contribute in many ways as well. 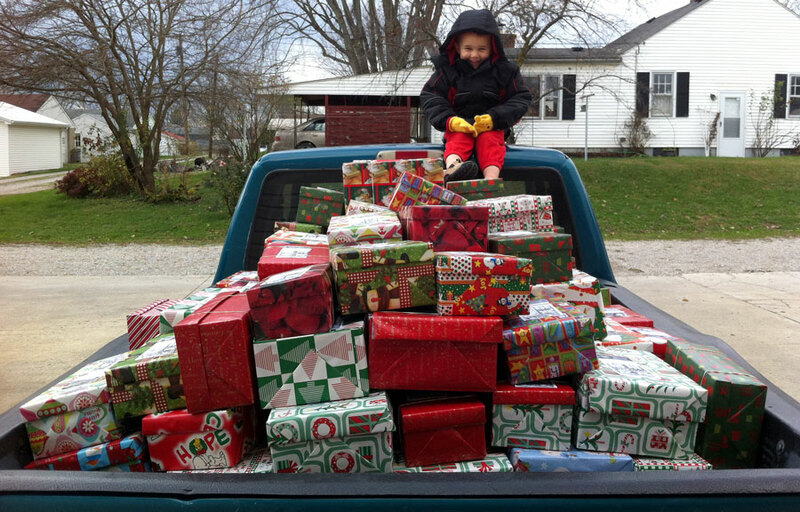 How many Christmas Child shoeboxes did your church collect this year? We’d like to share that on UBCentral for other churches. We even have a form you can use to report what your church did with Operation Christmas Child. 27 Nov Still More Shoeboxes! 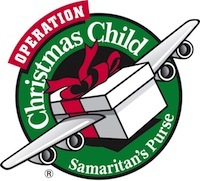 Gene and Lana Wolfe head up Operation Christmas Child for Praise Point. Here they are with the 2011 shoeboxes. Every year, dozens of UB churches participate in Operation Christmas Child, a ministry of Samaritan’s Purse. Several thousand shoeboxes are sent by UB churches to children around the world. We invited churches to tell us how many shoeboxes they collected. We have posted results here and here. We still invite you to tell us how many boxes your church filled. Melina Agler (right), church secretary, writes: “Praise Point has been preparing shoeboxes for Operation Christmas Child since the church opened its doors in 2006. Each year the boxes are placed at the front of the church on the last Sunday they are received, and a time is set aside to have special prayer for those that will receive these gifts. This year the children of the church gathered with the pastor at the front of the sanctuary for prayer, each child taking a box to hold during the prayer. The junior church children (ages 3-5th grade) also prepared 20 boxes to add to the boxes received from the congergation. Members of Shiloh with the 160 boxes collected in 2007, their first year. Every year, dozens of UB churches participate in Operation Christmas Child, a ministry of Samaritan’s Purse. No doubt several thousand shoeboxes are sent by UB churches to children around the world. We invited churches (and still invite you) to tell us how many boxes they filled. Brian Magnus, bishop of the UB Church in Canada, reports that Shiloh UB, a small country congregation of about 25 people, filled 413 shoeboxes his year! Donna Doern, from Shiloh UB, added: “We still had some funds available for shipment costs, and decided to use that money to send $500 to Turn on the Tap through Samaritan’s Purse. Also another $500 to the feeding program in Haiti. We concluded our pledge today for the David and Melissa Kline family with nearly $2,200 as well.” Here’s an online article about Shiloh’s participation. Tim Hallman (right), pastor of Anchor Community Church, writes: “The five UB churches of Fort Wayne/Allen County are collaborating together in their support of Operation Christmas Child. Those churches are Zanesville UB, Emmanuel UB, South Scipio UB, Union Chapel UB, Anchor UB. Four of the churches have been involved with OCC–some for a few years, others for quite a few. “This year, 1056 shoeboxes were filled by four of the five churches. Next year all five churches plan to participate. Our goal is to collect at least 1100–maybe even 1200! Arlys Ross, wife of Pastor Don Ross, writes: “This year Victory Chapel became an official Drop-Off Site for Operation Christmas Child. We discovered there were no drop-off sites in our area, so we decided to change that situation. 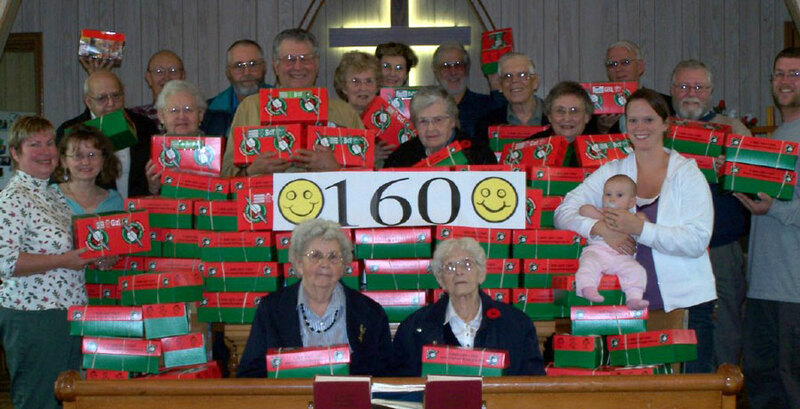 Altogether, 160 shoeboxes were dropped off at our church last week. Our goal was to have 100 boxes, but God blessed the children with an extra 60 boxes. Daryl Shaffer of Ebenezer UB writes: “A challenge was made to the congregation by our Pastor, David Grove, to increase the number of boxes that were collected last year (268 boxes). Members of the congregation had a yard sale to help with the $7 shipping cost on the boxes, and our Missions Commission covered part of the shipping cost as an incentive to fill more boxes. Between the two, there was no shipping cost to the congregation. A total of 352 boxes were collected. Stuart Johns (right), pastor of Idaville UB, writes: “We have a missions center in our church that the Outreach Commission maintains. Every couple of months the focus of the missions center changes, but each time there is a way that our people can give to missions. “During October, the missions center was focused on the Operation Christmas Child and the collection of shoeboxes. Announcements were made each week to encourage our congregants to consider putting a shoebox gift together for a child. Samuel Suman (right), pastor of Trinity UB, writes: “This was our first year participating as individual box builders. In the past we collected the ‘stuffings’ and gave them to one person to fill and process them. This year each person filled one or more boxes and placed them in the sanctuary. This is the third year Anchor has participated. 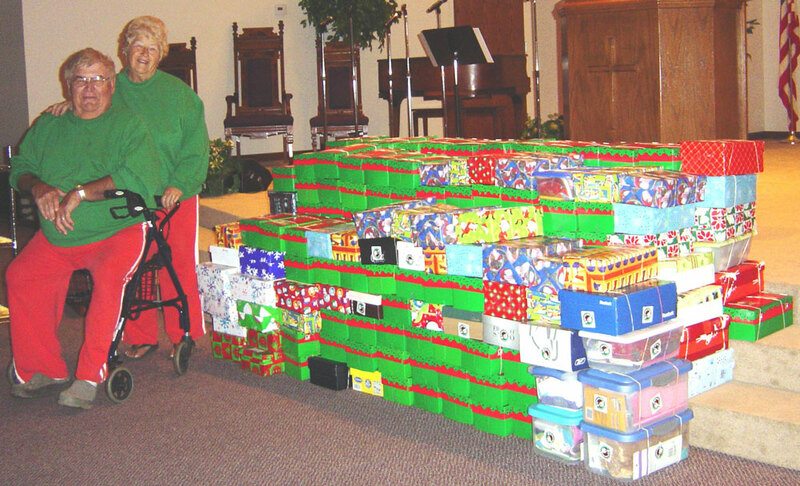 On November 13, people brought their filled shoeboxes and set them on a table in the foyer. At the end of the service, while the worship team led in the final song, the children of the church, with the help of a few adults, carried all of the boxes down the center aisle and laid them on the altar. 22 Nov How Many Shoeboxes Did Your Church Collect? Every year, dozens of UB churches participate in Operation Christmas Child, a ministry of Samaritan’s Purse. Parishioners fill shoeboxes with items for a child, then the shoeboxes are taken to a collection center and forwarded to Samaritan’s Purse. Somewhere in the world, a child eventually opens that box. November is the time for collecting the shoeboxes. We’ve heard verbal reports about churches collecting their boxes–sometimes a few dozen, sometimes hundreds. How many Christmas Child shoeboxes did your church collect this year? We’d like to share that on UBCentral for other churches. We even have a form you can use to report what your church did with Operation Christmas Child.